Introduction The inhabitants of the area of Oman have long prospered on Indian Ocean trade. In the late 18th century, a newly established sultanate in Muscat signed the first in a series of friendship treaties with Britain. Over time, Oman’s dependence on British political and military advisors increased, but it never became a British colony. In 1970, QABOOS bin Said al-Said overthrew the restrictive rule of his father; he has ruled as sultan ever since. His extensive modernization program has opened the country to the outside world while preserving the longstanding close ties with the UK. Oman’s moderate, independent foreign policy has sought to maintain good relations with all Middle Eastern countries. History From the 6th century B.C. to arrival of Islam in the 7th century A.D., Oman was controlled and/or influenced by three Iranian dynasties of Achaemenid, Parthians, and Sassanids . Achaemenid (6th-4th century B.C.) controlled and/or influenced over the Oman peninsula. This was most likely exerted from a coastal center such as Sohar . By about 250 B.C., Parthian dynasty brought the Persian Gulf under their control and extended their influence as far as Oman. Because they needed to control the Persian Gulf trade route, the Parthians established garrisons in Oman. In the third century A.D., the Sasanids succeeded the Parthians and held area until the rise of Islam four centuries later . On the advent of Islam, the faith reached Oman within Prophet Muhammad’s lifetime. The conversion of Omanis is usually ascribed to Amr ibn al-As, who visited the region between 627-32. By the middle of the eighth century AD, Omanis were practicing a unique sect of the faith, Ibadhism, which remains a majority sect only in Oman. Ibadhism has been characterized as “moderate conservatism,” with tenets that are a mixture of both austerity and peace. The Portuguese occupied Muscat for a 140-year period (1508–1648), arriving a decade after Vasco da Gama discovered the seaway to India. In need of an outpost to protect their sea lanes, the Europeans built up and fortified the city, where remnants of their colonial architectural style still remain. Revolting tribes drove out the Portuguese, but were pushed out themselves about a century later (1741) by the leader of a Yemeni tribe leading a massive army from varying other tribes, who began the current line of ruling sultans. A brief Persian invasion a few years later was the final time Oman would be ruled by a foreign power. Oman has been self governing ever since. The British slowly brought about a collapse of Muscat and Oman’s “empire” by the end of the nineteenth century without use of force. Through gradual encroachment on its overseas holdings economically and politically, they caused Oman to retreat to its homeland. In time Britain held such sway in Muscat and Oman itself that it became in effect, and later in fact, a British protectorate. Having control of the country’s military, the British helped subdue rebel tribesmen in the 1950s, driving most into Yemen. But the sultan ran a repressive regime, with laws forbidding numerous activities, including the building and even repair of his subjects’ own homes without permission. In 1970, almost certainly with British backing, he was overthrown by his son, the present ruler, Qaboos bin Said Al Said, and the country declared independence the following year as the Sultanate of Oman. Qaboos is generally regarded as a benevolent absolute ruler, who has improved the country economically and socially. Oman has maintained peaceful ties on the Arabian Peninsula ever since ending another tribal rebellion in the southwest in 1982 by forging a treaty with Yemen. Oman’s oil revenue has been consistently invested in the national infrastructure, particularly roads, schools, hospitals, and utilities. More than ever, the country is poised to take advantage of its strategic trade location on the Indian Ocean and the Persian Gulf to further its economic growth and role in the world. Except for those who travel to remote Middle East locales, the country has seldom been in the public eye other than for the use of its military bases by U.S. forces in recent years. American and British bombing raids were launched in 1991 from Oman against Iraq in the Gulf War. A decade later, U.S. forces stationed there were involved in raids against Afghanistan and Osama bin Laden. Politics Chief of state and government is the hereditary sultān, Qaboos Bin Said Al-Said who appoints a cabinet called the “Diwans” to assist him. In the early 1990s, the sultan instituted an elected advisory council, the Majlis ash-Shura, though few Omanis were eligible to vote. Universal suffrage for those over 21 was instituted on 4 October 2003. Over 190,000 people (74% of those registered) voted to elect the 84 seats. Two women were elected to seats. The country today has three women ministers. H.E. Dr. Rawiyah bint Saud al Busaidiyah – Minister of Higher Education, H.E. Dr. Sharifa bint Khalfan al Yahya’eyah – Minister of Social Development and H.E. Dr. Rajiha bint Abdulamir bin Ali – Minister of Tourism. 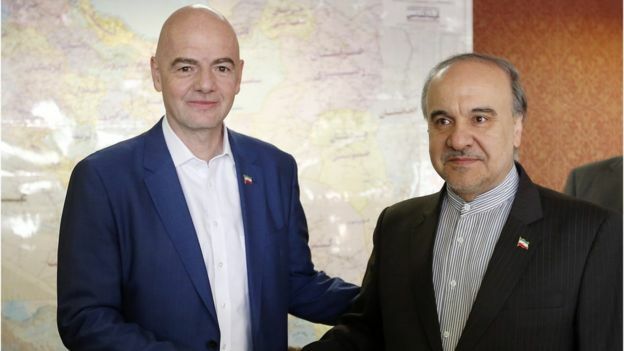 Fifa’s president, Gianni Infantino, was also in attendance, along with Iranian Sport Minister Masoud Soltanifar. 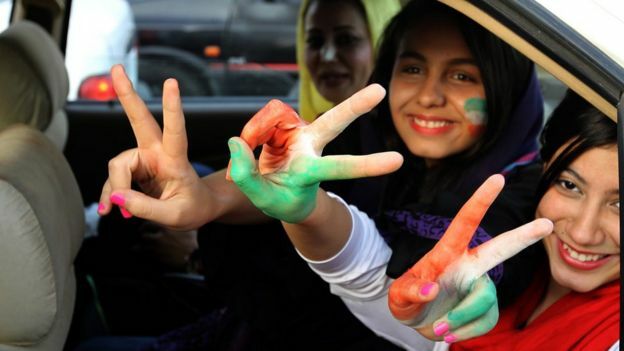 According to the semi-official ISNA news agency, Iranian interior ministry spokesman Seyyed Salman Samani said the female football fans were not arrested – but transferred to a “proper place” by police. Women’s rights activist Masih Alinejad on Wednesday called on women to attend Thursday’s match. “The Fifa president will be in the stadium tomorrow (1 March),” she wrote. Another user said it was a “basic right” for women to enter stadiums with men, and said this match was “the best chance to break the 35-year-old taboo”. 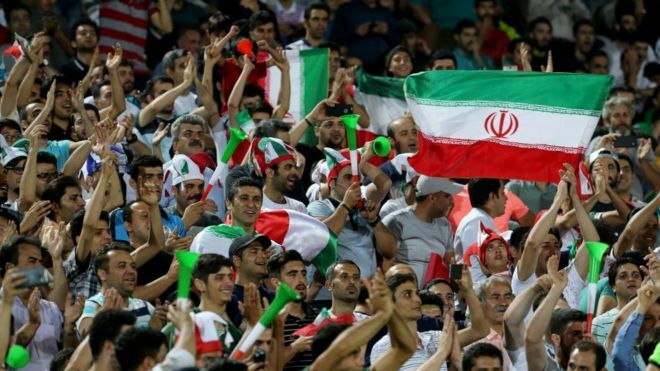 Azadi means “freedom” stadium in Persian, and one Twitter user pointed out the hypocrisy of “naming a stadium freedom but banning half the population from entering”. The women caught sneaking into the stadium were trying to attend a particularly significant game, one being watched by the most powerful man in world football, Fifa’s boss. It seems they wanted to attract Mr Infantino’s attention to the ban on women attending games. And the sensitivity of the issue was apparent as Mr Infantino stood beside the country’s sports minister during a live TV interview. “It’s very clear that politics should stay out of football and football should stay out of politics,” Mr Infantino said the news conference. “There are of course political issues between countries all over the world but this should not have an impact,” he said. Mr Rouhani asked Fifa to make sure that “people are not deprived of watching competitions in their own stadiums”. Tunisia- Tunisian Ministry of Tourism and Handicrafts has announced that Qatar is investing more than 380 million dollars to develop two major tourism projects. Qatar will establish a number of tourism projects in Tunisia, some of which are under construction, including Qatari Diar’s $80 million desert resort project in Tozeur that is scheduled for inauguration in 2018. Several tourism projects in Tunisia have Qatari investors, including a mega project that is valued at $300 million and which will see a resort built over 15 hectares in Gammarth, north of the Tunisian capital. Tunisia has welcomed 5.7 million tourists in 2016 and is expected to see more than 6.5 million tourists this year, the ministry added. Selma Elloumi Rekik, the minister of tourism and handicrafts, announced that Tunisia is preparing a two-day investment forum on October 19 to urge investments in the tourism sector and create the conditions for the revival of the industry. To promote this event, Elloumi visited a number of Arabian Gulf countries including Saudi Arabia, UAE, Qatar, Oman and Jordan, urging businessmen to visit Tunisia and invest in the promising tourism sector. The minister added that Tunisia is working on a new strategy to attract tourists and lure Arabian Gulf investments. Qatar Development Fund is considering an estimated 250 million dollars to fund some public projects in Tunisia. Tunisian Finance Minister Lamia Zribi announced that Tunisia will receive up to one billion dollars as funding for the state budget. Egypt has topped a list of Middle East (ME) countries that are safe for tourism and vacations, according to the US government. Other ME countries deemed safe include Jordan, Oman, UAE and Qatar. In a supplement issued by the Independent ‘Indy 100’, the US government has advised citizens to review the information on the levels of safety for countries around the world, available through US embassies and consulates. Currently, the regions of lowest safety due to terrorism by the “Islamic State” (IS) group are located in Iraq, Syria and Turkey. Whereas the US government urges citizens to be cautious while traveling anywhere in Europe due to fears of suicide attacks by the IS group. The report comes just in time, as Egypt seeks to attract tourists from Russia and Western Europe in December, one year after the Russian airplane crash that took place in central Sinai in October 2015. Starting last November, Russia suspended all incoming flights to Egypt. England then suspended flights going to Sharm El-Sheikh. Russian and British flights represent around 40 percent of inbound tourism to Egypt annually. The Egyptian government expects improvement in the tourism sector starting the new year, which will positively reflect on providing much-needed foreign currency in the wake of a decision by the Central Bank of Egypt to float the Egyptian pound against the US dollar earlier this month. While the total capacity of hotels in Egypt is upwards of 225,000 hotel rooms, 65 percent of those are located in the Red Sea and South Sinai regions, attracting seaside tourism from around the world.